The Annozilla project is designed to view and create annotations associated with a web page, as defined by the W3C Annotea project. The idea is to store annotations as RDF on a server, using XPointer (or at least XPointer-like constructs) to identify the region of the document being annotated. The intention of Annozilla is to use Mozilla's native facilities to manipulate annotation data - its built-in RDF handling to parse the annotations, and nsIXmlHttpRequest to submit data when creating annotations. . In this example: firefox opened the NCBI home page (right side). 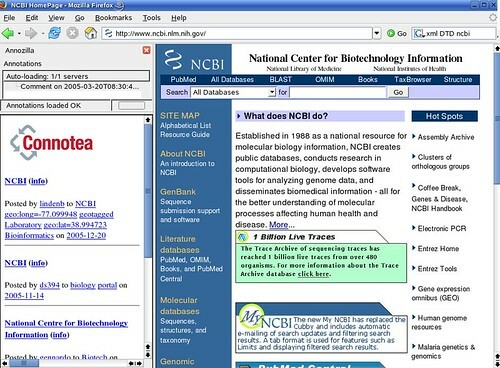 Once the page is loaded, annozilla fetches the bookmarks about NCBI from connotea (top left). Double clicking in the annotations makes annozilla download the body of those bookmarks (bottom left). which is really less interesting !!!... Anyway, this was still a nice to write and it was proof of concept on how to use the connotea API. "<!DOCTYPE html PUBLIC \"-//W3C//DTD XHTML 1.0 Strict//EN\" \"http://www.w3.org/TR/xhtml1/DTD/xhtml1-strict.dtd\">"